Hi, I'm new to adding compressed Pokémon sprites into Generation I, and I'd like to directly convert a PNG into 2bpp format and then compressed sprite data to be interpreted by Pokémon Red/Blue/Yellow but I came across a problem. My intention is to use a new exploit I discovered to add custom sprites into the game without modifying the ROM using arbitrary sprite glitch Pokémon and I intend to make a video tutorial for this. I can do it already thanks to this post by Danny-E 33, but I want to avoid using Tile Molester because it has a bad name (with target audience in mind as I have a large number of viewers) and I'd rather convert a PNG file directly to RBY's sprite format. 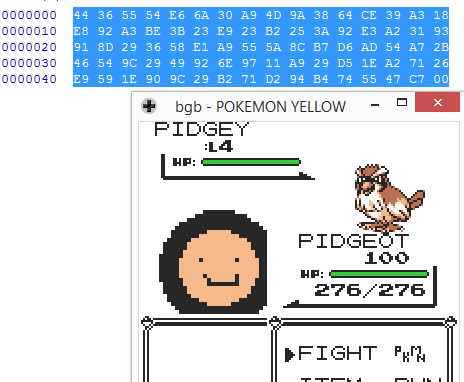 I came across rgbgfx (Stag091's description), and I used rgbgfx -o out.2bpp in.png to convert a simple 32x32 smiley face into 2bpp, and then I used Stag019's tool pkmncompress to create the compressed image, opened it up in a hex editor and then pasted the data to DAC9 in WRAM (which is where glitch Pokémon 0xE6 takes its back sprite in English Yellow). The sprite resembled the image I created which is a good sign but unfortunately was scrambled. I didn't cause the inverted sprites glitch and the 4x4 (0x44) dimension is correct for a backsprite but I wonder if maybe I shouldn't be using a PNG directly from Windows 8's Paint or if I shouldn't have made the sprite 32x32 pixels. (This confused me when using the previous method which required that size because when they appear in the game backsprites are 56x56 pixels). I used Windows 8 for this and Command Prompt. Does anybody know what the issue might be and how to fix it? Thanks in advance! Edit: Using a 56x56 pixel image generated a 7x7 sprite so that wasn't the problem. The sprite tiles are arranged in column-major order, not row-major. Imagine reflecting your back sprite across the diagonal axis: it would become correct. If pokered behaves like pokecrystal, then running "python gfx.py 2bpp pic/monback/whatever.png" on a 56x56 backsprite will automatically transpose the tiles. Worst-case scenario, you have to do it yourself in Paint before converting. Edit: The rgbgfx -h flag ("Lay out tiles horizontally rather than vertically") sounds like it would correct the problem. Adding the -h flag worked perfectly.